More than 1,300 Texans displaced by Hurricane Harvey were dropped Tuesday from a Federal Emergency Management Agency program that pays for hotel rooms for people while they find new places to rent or figure out how to repair homes they own. The decision affected Texans who rented before the storm more than it impacted those who own their damaged homes. That's because owners who are making efforts to repair their homes were given an extension through May 31. When it comes to the renters who were still staying in hotels, FEMA officials said that Harris County now has "adequate renting resources" available. Housing advocates took issue with FEMA’s decision to allow homeowners to remain on the program while deciding to remove people who had been renting property before the storm. 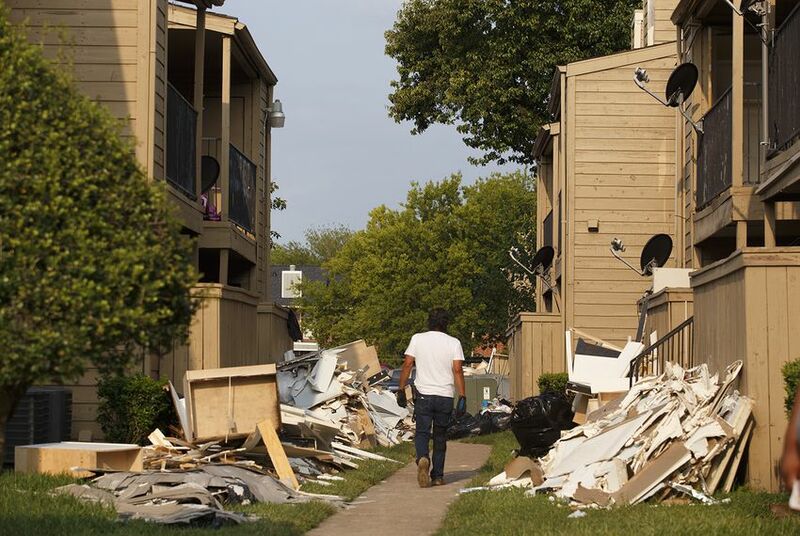 “We are very much of the belief that renters are left behind during disaster recovery, and this is just another example of that,” said Christina Rosales, a spokeswoman with advocacy group Texas Low Income Housing Information Service. In Harris County, 650 homeowners remain in the transitional sheltering program, and there are still 6,764 total applicants left in the program that were displaced from a wide swath of southeast Texas because of Harvey, Hersh said. Hersh said her agency uses a number of factors to determine if someone should be dropped from the program, including whether housing is available for rent in their county and if the person has declined housing options from the Texas General Land Office, which is overseeing some short-term programs that FEMA historically administered. FEMA began notifying people they would need to leave their hotel rooms last Thursday, according to an agency press release. FEMA stopped paying for hotels for 1,178 people in Harris County, 56 people in Brazoria County, 35 people in Montgomery County, 33 people in Nueces County and 16 people in Fort Bend County, Hersh said. Rosales said FEMA was mischaracterizing the situation for many of the renters that benefited from the hotel program. “I don’t think they are understanding this, or they aren’t counting, but a lot of that housing is not affordable for low-income people,” she said. “They’re people who need a place to live and haven’t been able to find something they can afford." Rosales also had concerns over the location of the property available for rent in a county as large and populated as Harris, saying the apartments might not be available in the community where displaced people lived before the storm. FEMA does not keep track of the location of rentable property, only the number of units available, Hersh said. Market experts at Apartment Data Services could not be reached for comment Wednesday. Hersh said that FEMA provides the funding for housing, but prefers for local governments to handle the finer points of housing locations within the counties. Alan Bernstein, a spokesperson for Houston Mayor Sylvester Turner, said residents removed from the transitional sheltering program can call 211 for assistance in finding housing that meets their needs.